Subcellular localization of PfPREX. 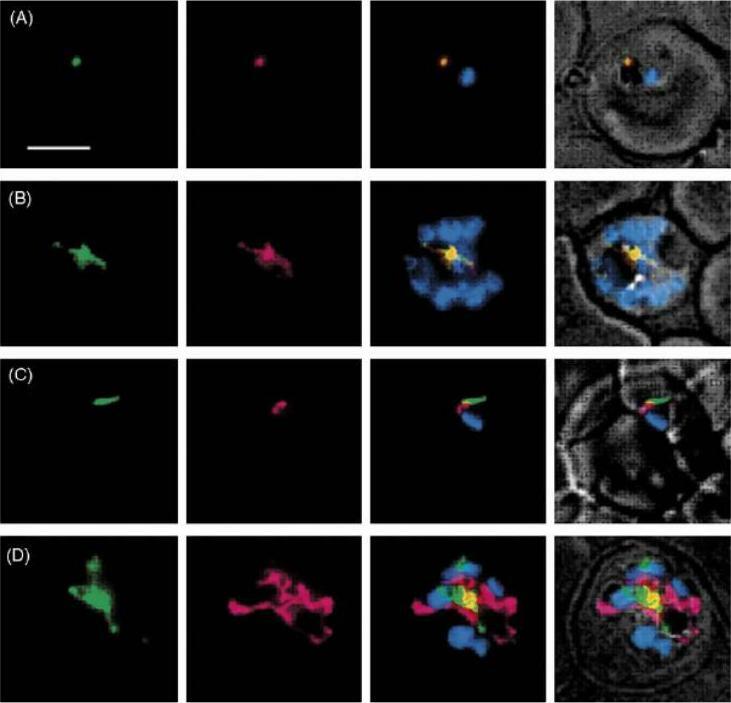 Parasites were doubly transfected with pSSPF2/PfPREX-GFP and pSSPF2/PfACP-DsRED (A and B), or with pSSPF2/PfPREX-GFP alone (C and D). The mitochondrion of the pSSPF2/PfPREX-GFP single transfectant parasite (C and D) was stained with MitoTracker Red CM-H2XRos (MTR). Panels in each row represent: green signal of GFP (far left); red signal of DsRED specifically localizing to the apicoplast (A and B) or MTR to the mitochondrion (C and D) (second from the left); merge of the green and red signals as well as the blue signal of Hoechst 33342 indicating the position of the parasite nucleus (second from the right); overlay of the merged image with the phase contrast image (far right). (A) Early trophozoite; (B) Schizont; (C) Early trophozoite; (D) Schizont. Scale bar: 5 mm. PfREX localizes to the apicoplast. Seow F, Sato S, Janssen CS, Riehle MO, Mukhopadhyay A, Phillips RS, Wilson RJ, Barrett MP. 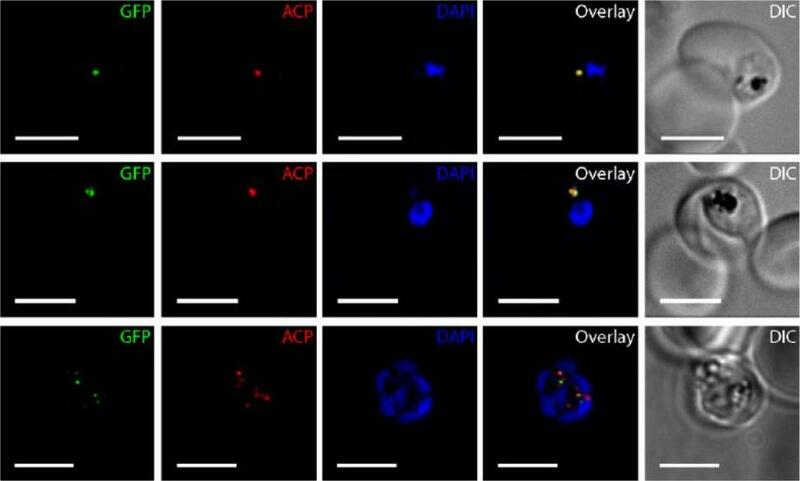 The plastidic DNA replication enzyme complex of Plasmodium falciparum. Mol Biochem Parasitol. 2005 141:145-153. Copyright Elsevier 2009.